Vodafone Essar, one of India’s leading cellular services providers, today announced the launch of its latest generation eco-friendly solar charging handset in India. The new handset uses a solar powered solution to benefit users in areas with adequate sunlight. UK’s Chancellor of the Exchequer, Rt Hon George Osborne MP and Marten Pieters, MD and CEO, Vodafone Essar Ltd., today launched the VF 247 Solar Powered phone at the Vodafone store in Fort, Mumbai. Vodafone’s solar powered phone is launched for people residing in areas where electric supply is unstable, so that consumers can rely on solar charging to remain connected. This launch is likely to enable more people in rural India to go mobile and thus increase penetration from the current 20%. 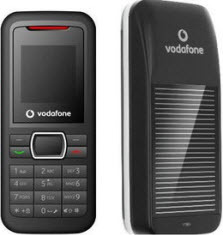 Vodafone has priced VF 247 at INR 1500 or USD 35.